If you’re eager to incorporate cake into your Thanksgiving buffet — or if you just want to lay off the pumpkin pie for a change — this not-too-sweet confection won’t disappoint. Taking some time with the piped lace design makes it look as if the cornucopia is sitting on a tablecloth. Make this striking cornucopia cake for your Thanksgiving table. When preparing the yellow cake batter, stir 3 teaspoons instant espresso powder into the sifted flour, and substitute 1⁄2 cup half-and-half and 1⁄2 cup coffee liqueur for the milk. After the cakes are completely cool, torte both cakes so that you have four layers. Frost one layer with milk chocolate frosting, and set the corresponding layer on top. Add a layer of frosting, followed by the third layer, another layer of frosting, and the final layer of cake. Apply a crumb coat (thin layer) of frosting to the entire cake, and refrigerate it for 1 hour. Divide and tint the stiff decorator frosting as follows: 2 cups egg yellow and 2 cups harvest brown. Frost the cake with yellow frosting. 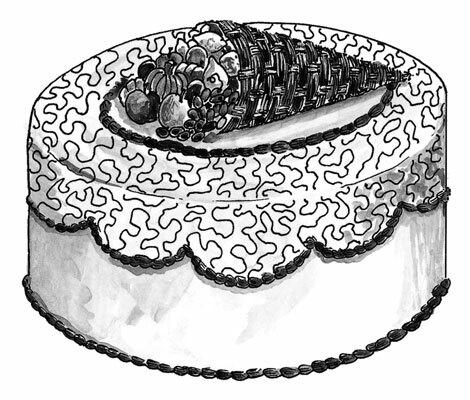 In the center of the cake, use a toothpick to sketch an oval. Lay the ice cream cone on its side in the center of the oval. Outfit a pastry bag with a coupler, a #47 tip, and brown frosting. Pipe a basket weave design on the ice cream cone cornucopia. Arrange the Swiss fruits so that they appear to tumble out of the cornucopia. Outfit the brown frosting bag with a #6 tip, and pipe an oval border around the cone, following your previous sketch. Place the 6-inch plastic lid along the sides of the cake and press gently to create an impression of downward arcs. With the #6 tip and brown frosting, pipe little beads along the arcs. Also pipe a row of beads all around the base of the cake. Outfit the brown frosting bag with a #1 tip, and in between the oval and the downward arcs, pipe a lacy design with a pattern of curves and lines.